Add a tough, yet beautiful layer of defense with strong adhesion that resists blow offs and helps protect the most vulnerable areas such as hips & ridges. DuraRidge® Hip & Ridge Shingles are the first to feature the Triple Layer protection® of our patented SureNail® Technology. SureNail® Technology adds a layer of reinforcing fabric in the nailing zone. A new roof can give your home a whole new look and DuraRidge® Hip & Ridge Shingles provide the finishing touch. Featuring a bold, dramatic appearance and vibrant TruDefinition® colors, DuraRidge® Hip & Ridge Shingles are a beautiful complement to our TruDefinition® Duration® Series shingles. In fact, Owens Corning and your contractor can help you choose a DuraRidge® Hip & Ridge Shingle and TruDefinition® Duration® Series Shingle that are perfectly matched to deliver beauty and performance for many years to come. 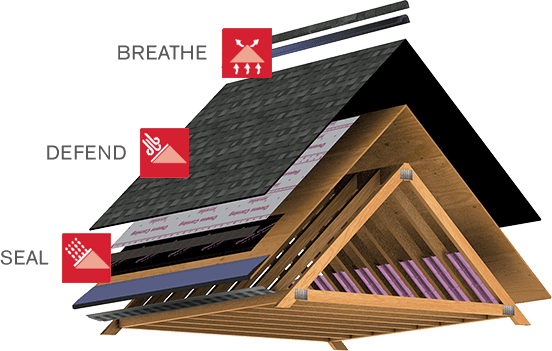 Part of the Owens Corning® Total Protection Roofing System®^. Lineal Feet per Carton 20ft. 1. Limited to single layer application. 2. The surface burning characteristics of these products have been determined in accordance with ASTM E84. This standard should be used to measure and describe the properties of materials, products or assemblies in response to heat and flame under controlled laboratory conditions and should not be used to describe or appraise the fire hazard or fire risk of materials, products or assemblies under actual fire conditions. However, results of this test may be used as elements of a fire risk assessment which takes into account all of the factors which are pertinent to an assessment of the fire hazard of a particular end use. Values are reported to the nearest 5 rating. 3. Preproduction qualification testing complete and on file. Chemical analysis of each production lot required for total conformance. 4. The surface burning characteristics of these products have been determined in accordance with ASTM E84, UL 723, and CAN/ULC-S102. These standards should be used to measure and describe the properties of materials, products, or assemblies in response to heat and flame under controlled laboratory conditions and should not be used to describe or appraise the fire hazard or fire risk of materials, products or assemblies under actual fire conditions. However, results of this test may be used as elements of a fire risk assessment, which takes into account all of the factors, which are pertinent to an assessment of the fire hazard of a particular end use. Values are reported to the nearest 5 rating. 5. Preproduction qualification testing complete and on file. Chemical analysis of each production lot required for total conformance. 6. The surface burning characteristics of these products have been determined in accordance with UL 723, ASTM E84 or CAN/ULC-S102. This standard should be used to measure and describe the properties of materials, products or assemblies in response to heat and flame under controlled laboratory conditions and should not be used to describe or appraise the fire hazard or fire risk of materials, products or assemblies under actual fire conditions. However, results of this test may be used as elements of a fire risk assessment which takes into account all of the factors which are pertinent to an assessment of the fire hazard of a particular end use. Values are reported to the nearest 5 rating. 7. All values are approximate. 8. The surface burning characteristics of these products have been determined in accordance with UL723, ASTM E84, or CAN/ULC-S102. These standards should be used to measure and describe the properties of materials, products, or assemblies in response to heat and flame under controlled laboratory conditions and should not be used to describe or appraise the fire hazard or fire risk of materials, products or assemblies under actual fire conditions. However, the results of these tests may be used as elements of a fire risk assessment that takes into account all of the factors that are pertinent to an assessment of the fire hazard of a particular end use. Values are reported to the nearest 5 rating.